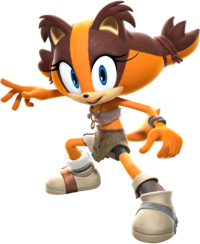 Sticks the Badger (or simply Sticks) is a female anthropomorphic jungle badger and one of the main characters of the Sonic Boom spin-off franchise of Sonic the Hedgehog. She primarily uses boomerangs, and her character is portrayed to be energetic, wild, and friendly, but is sometimes paranoid and crazy. Sticks makes a playable appearance in Mario & Sonic at the Rio 2016 Olympic Games. In the Nintendo 3DS version, Sticks is only playable in the Archery and Archery Plus events. She is also an unlockable character; she can be unlocked by defeating her in Archery Plus on Day 3 of Sonic's story. Sticks has a similar role in the Wii U version, being an unlockable playable character exclusive to the Archery event. Here, she is unlocked if she is defeated after challenging the player following a tournament. This page was last edited on March 30, 2019, at 20:25.